Green is one of my favorite colors this time of year. Isn't it so fresh and bright!? 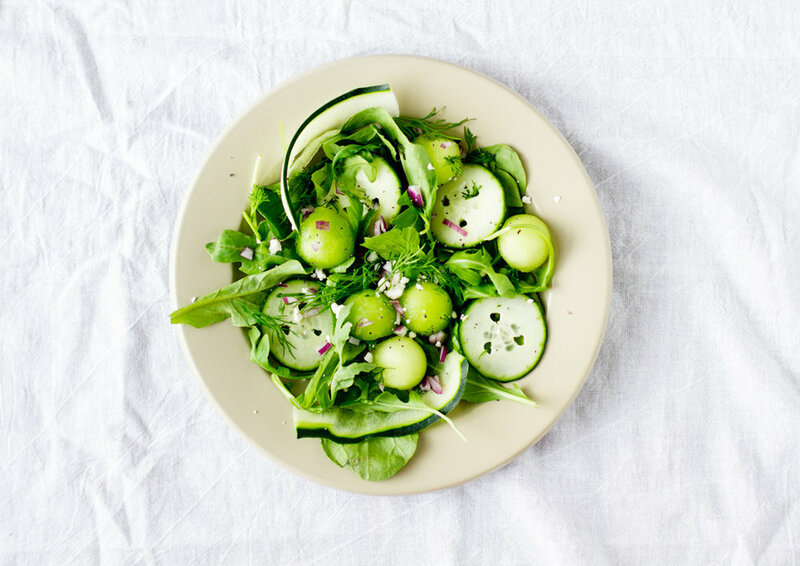 This monochromatic green salad with a dash of purple is definitely an extension of my love for this beautiful hue. I was photographing a series of Autumn recipes for a magazine last week and was having a little bit of a tough time breaking away from bright summer-like colors. So I snuck in this salad as an avenue for my desiring of greens! I was able to get fresh dill, arugula and these delicious red onions at the farmers market in Union Square. While the original recipe doesn't actually call for arugula I thought it added a nice texture to make it more of a hearty salad and it can withstand the tangy lemon/honey dressing. Picking types of arugula to use was a bit tricky...have you ever noticed how many different kinds there are? I opted for a combination of wild arugula which has a little bit of a more peppery taste and funny enough the second kind I chose is simply called arugula (that's the one with the rounder leaves). At first glance you might think honeydew in a salad with cucumbers and onion is a bit odd but trust me, it somehow works together really well. 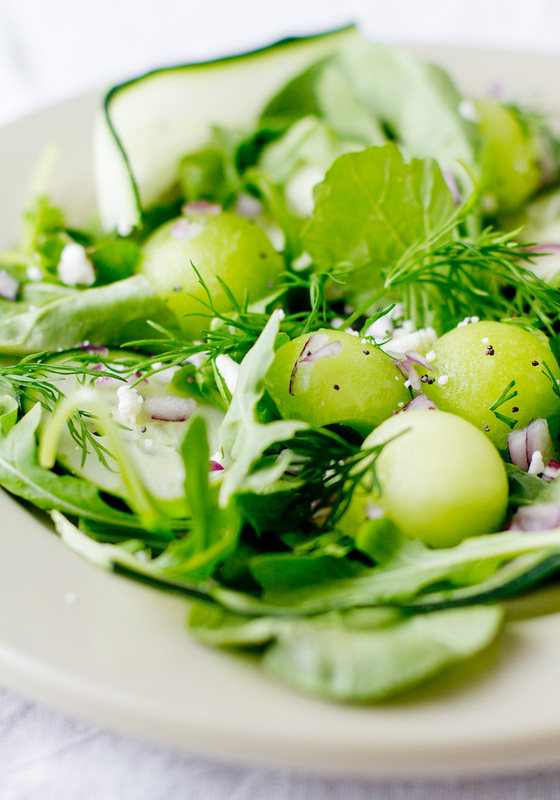 Especially with the feta, poppy seed and lemon-y dressing, it's such a refreshing taste. This is a great summer salad to serve at your 4th of July BBQs! Pour lemon juice into a large bowl and whisk in olive oil in a slow, steady stream until completely incorporated. Whisk in honey, salt and pepper. Add melon, cucumber, onion, dill and arugula. Toss to combine. Just before serving top with feta cheese and sprinkle with poppy seed. Makes 10 servings. Recipe from Better Homes & Gardens mag.